*Get your popcorn ready ’cause in the words on singer Betty Wright, tonight is the night. That’s right, the biggest event of the year, maybe of our lives, is being staged in Denver. Yes, we’re talking about the first of three presidential debates between President Obama and his Republican challenger Mitt Romney. Brett O’Donnell, America’s premier debate coach, has written and insightful piece for the Daily Beast on the key pivot points in tonight’s throwdown. 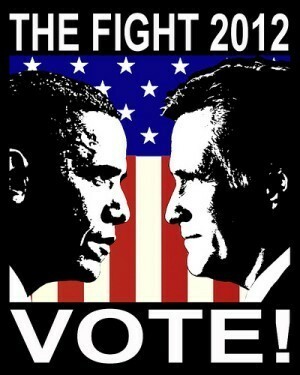 Tonight, President Barack Obama and former governor Mitt Romney will step onto the stage for the first of perhaps the most consequential series of presidential debates in American history. What is at stake is only matched by the premium Americans have grown to place on the art of political debate itself. Most Americans believe that debate is as much a part of the fabric of American politics as our first elections, but in reality general-election presidential debates are a relatively recent phenomenon, the first televised battles between Kennedy and Nixon also being the first debates between the nominees of the major parties. We have come to treat debates as part of the gauntlet that candidates must traverse and the one place to satisfy our desire for competition. And so we pay careful attention to the attacks and counterattacks, who can land the better body blows and if either can score a knockout punch through a clever line or zinger. The Republican primary season only served to ratchet up those expectations. Michele Bachmann (full disclosure: I worked for her) knocked out Tim Pawlenty. Rick Perry knocked himself out. And the battles between Newt Gingrich and Romney were the stuff high-school debaters dream about. But lost in all of the metaphors of competition is a fight over the direction of the country. While millions will tune in to see which of their gladiators wins the duel, what should not be lost is what we learn about these two men and the direction each would take the country over the next four years. Both are competing for a small slice of undecided voters in 10 states. But both are also attempting to inspire their own bases to turn out in November. So both will have to walk the “tightrope” of being respectfully aggressive—particularly Romney, who must attack Obama without sullying the office he holds. We should pay particular attention to whether Romney can convince voters that Obama is to blame for present economic conditions and that things are getting worse—or if Obama can convince voters that we’re headed in the right direction and that to change course now would endanger a fragile recovery. So far the president is winning this argument by a razor-thin margin. The debates could turn the tide significantly. We should pay attention to who starts strong. The first 30 minutes of the first debate are the most important. That will set in motion the narrative, and help determine whom voters perceive to be winning the debates. It’s hard to recover from a bad first outing. Remember President Bush in 2004, or then–vice president Al Gore in 2000. Ronald Reagan was one of the few who recovered from a poor first showing to win the second one in 1984, overcoming the perception he was too old to be president. In spite of the conventional wisdom otherwise, both men are highly skilled orators. The candidate who is able to execute his strategy and clearly communicate his message will triumph. Read/learn more at the Daily Beast. Regardless of Obie’s admitting to “not” being that good at debating, & Mit supposing to “have talent”?, Obie haaaaaas to be waaaaay better than he OR they give him credit for! So “I” say?,….if Obie pulls a “J.Kerry” & “just sits there”/doesn’t go hard ‘on this “sitting duck”?, then my theory of the system controlling Obie, keeping him FROM debating as well as he could AND/OR responding the all the disrespectful BS he & his wife have been subjected to!!! NO man would just “be above”/”take this shyt”, without being maaaaade to just…chill. Tonight’s debate will tell/show ALL! Yes…if Obie doesn’t do so well, it couuuuuuld be the “drama/pageantry” of it all?, but I….think not. The system/YT has NO plan B and has been sticking to the only things they have EVVA used…..lies,fear,manipulation & bigotry! And they now are finding out, that there ain’t that many left OF them! (Racist!) So….to control Obie, keep the possibility of the Right winning?, is the only thang they have left, as they successfully did in 2004 with good ole…J. Kerry. He sat ‘on his azz (against ANOTHER idiot!!) & ALLOWED all that happened to happen, when all he had to do, was BE WTF he clearly was…..better than GW. So yo POTUS! ?….grow AND grab yo balls & …..git this shyt over wit, mayn!!!! Chuuuuuuch!